Near the end of his by turns self-effacing and scathing Golden Globes monologue Sunday, Seth Meyers set up Jessica Chastain for one of the night’s top punchlines. “The Golden Globed turned 75 this year…” Meyers started. “…But the actress that plays its wife is still only 32,” Chastain quipped. He went on to enlist Billy Eichner, Issa Rae, Hong Chau and Amy Poehler in the clever extension of his “Late Night” bit “Jokes Seth Can’t Tell,” in which he cedes the stage to show writers Amber Ruffin and Jenny Hagel. Meyers’ approach — equally determined not to make the show about him and to not hold back on provocative humor — offered, to invoke another “Late Night” segment, a closer look at the evolving career of a comedian being tested on the job. He arrived at the Beverly Hilton for the NBC broadcast as a member of the male-dominated late night TV field amid long-coming reckoning over Hollywood's culture of sexism, sexual harassment and worse. “It’s been years since a white man was this nervous in Hollywood,” Meyers said, referring to himself. Meyers noted early on that perhaps a woman should have been tapped to host. “But if it’s any consolation, I’m a man with absolutely no power in Hollywood. I’m not even the most powerful Seth in the room tonight,” he said, pointing to Seth Rogen in the crowd. The former “Saturday Night Live” star hurled far more pointed barbs at Woody Allen (He called “The Shape of Water,” a film about a woman in love with a sea monster, “‘Manhattan’ in water.”) and Kevin Spacey (“I was happy to hear they’re going to do another season of ‘House of Cards.’ Is Christopher Plummer available for that, too? I hope he can do a Southern accent, because Kevin Spacey sure couldn’t.”). But Meyers saved his strongest fire for disgraced movie producer Harvey Weinstein — “the elephant not in the room,” as Meyers put it. 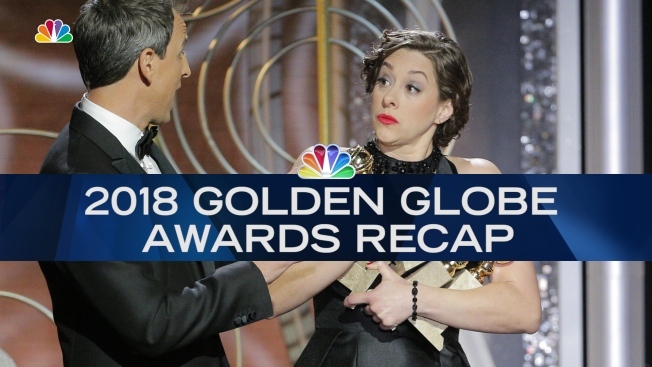 The joke — and Meyers’ quick, planned response to the reaction — exemplified his deft balancing act on a night like no other in Golden Globes history. The awards ceremony, long a quirky Hollywood sideshow spawned by the Hollywood Foreign Press Association, has become in recent years a closely watched precursor of the Oscars — not just for the winners, but for the quality of the hosting. That's been true since Ricky Gervais shocked the Globes back to life in 2010, followed by the team of Poehler and Tina Fey, and Jimmy Fallon, all "SNL" veterans. It was never more true Sunday night, when Hollywood turned to Seth Meyers to set the tone amid extraordinary times. His greatest strength proved refusing to try to get in the final word.